The RailRunner® Transition Unit (TU) provides the means of coupling RailRunner containers/chassis to standard locomotives and railcars equipped with conventional railroad knuckle couplers. Equipped with both a RailRunner coupler and a standard knuckle coupler, the TU is first attached to the lead RailRunner chassis/container before coupling with the locomotive or railcar. High Speed Capability: RailRunner bogies have passed all AAR required tests at 70 mph and runs at speeds up to 100+ miles per hour. Wheel Wear: RailRunner bogies feature radial steering that mitigates wheel wear and tear, reducing maintenance costs and extending product life. Smooth Ride Design: Slackless coupling and air spring shock absorber dampened suspension on bogies insure damage-free transportation and attracts fragile, high-value payloads to rail lanes. The slack-free RailRunner coupler provides almost 100% less slack than conventional intermodal and 95% less slack than typical double stack. 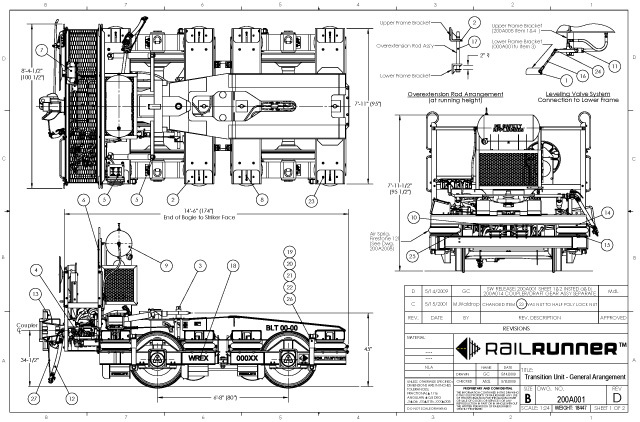 Rail Car Components: RailRunner bogies are equipped with standard, commercially available railcar equipment, wheels, axles, bearings, couplers/draft gear and braking systems. Easy-to-Load Design: RailRunner bogies easily couple with chassis using a failsafe-locking pin that secures the chassis to the bogies. Air suspension allows lifting of the road vehicle providing sufficient wheel clearance for the track. Carrying Capacity of Bogie: 91,000 lbs.